Outrage is a film that was shot in Rabun County, which is the same location that Deliverance was shot in, and the film really has a positive message about dealing with the past and pain. The main theme of the film is that people must let go of there own fear and anger in order to bring passion in to their lifes. Outrage not only has an interesting theme and premise, the film has several stars in the film including Micheal Madsen (Reservoir Dogs), Natasha Lyonne (Blade: Trinity), and Michael Berryman (The Devil’s Rejects). Even director Ace Cruz has a part in Outrage as Trey and here director Ace Cruz talks a little bit more about this film and how the law of attraction can create positivity in anyones’ life. (AC) No, this film represents present-day, but there are ghost-like qualities that one of the characters has that makes it a science fictionesque film. Also, there is the theme involving the law of attraction, which either attracts positive or negative energy. So there are spirits in the film that are encouraging Christine to move on from the pain of molestation, that was caused by Michael Madsen’s character Farragute. He comes back into Christine’s life when she is an adult and after Christine has dealt with some of the sexual abuse comitted by Farragute. Through some flashbacks Christine has begun to realize what has happened to her as a 10 year old girl and this man’s role in relation to her own negativity. Her life is out of control until she begins to recognize her past for what it is and this moves the film along to an eventual confrontation between these two characters. (AC) Yes, and Katie Fountain’s character is the hero in the film. She is trying to understand the negativity and pain in her life. (AC) Michael Berryman plays a healer who sets her on a journey to remember her past and to let go of the anger, hate, and negativity. Christine learns to forgive her attacker and to live her life free of the abuse. The film ends with Christine really having a new beginning even before confronting Michael Madsen’s character. She decides that she does not need to fire a gun at Farragute and kill him. Instead, she chooses mercy and forgiveness while moving on with her life. The film is really about healing our lives so that we can allow more positivity in. (AC) Yes, because she starts to have flashbacks and she notices all the negative emotions that she is experiencing. So, with help from Michael Berryman’s character she begins to piece together her past. “What you are inside is what you attract in your life“. The movie has attracted great reviews on various sites like imdb and yahoo movies. A must watch Outrage 2009 has a great star cast with veterans like Michael Madsen (Sin City, Kill Bill, Reservoir Dogs) and Natasha Lyonne (American Pie, Slums of Beverly Hills) star in Outrage, a white-knuckle thriller about the law of attraction, fate-changing decisions and facing the past. “Outrage is an interesting film that explores the power of the psyche and subconscious mind to determine or color our conditions, reality and experience,” Lyonne says. Cruz hopes audiences will not only immerse themselves in unbridled entertainment, but also take home the core message of Outrage. Watch the movie and you will identify with the message which is related to everyone and applies to all, surely there must be some incident where one can relate it to ones real life. As the spiritual conductor in “Outrage”, Pauly D starts to understand the meaning of the spiritual words he narrates in the film “Outrage”. When I was playing the character Billy, the words I would say in the movie, I started to apply in my real life, states “Pauly D”. It’s no hidden fact that the message of the movie has a lot of truth. It is better to watch the film in a big theater, without distractions to really get the true words of wisdom on what the character Billy has to say in the movie. The film talks about the pendulum of life. Billy’s character says “life is like a pendulum, sometimes life offers us bad things, but sooner or later it will start be good again. It’s just a matter of waiting patiently for the life to turn. If we all can recall in our own life how this is true, we can live a much better and peaceful life. It am very fortunate and lucky to be able to narrate the words of wisdom of Billy, I truly feel I am doing my part in spreading goodness in the world and helping me attain good karma, states, “Pauly D”. After interviewing Pauly D in his experience in “Outrage” he gave me a sense of awareness of the deepness this film really has, that I did not really notice until it was explained to me by Pauly D. The film “Outrage” truly deserves to be watched a second time to understand the hidden spiritual meaning in this Sci-Fi Thriller film. I can see how it won Best SciFi film at the Action on Film International Film festival. 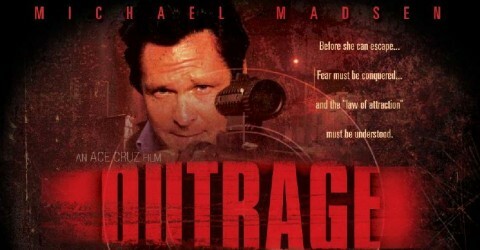 A must see movie www.outragemovie.com starring Michael Madsen, Natasha Lyonne and Michael Berryman. Award winning film “Outrage” discovers new actor. After watching the film “Outrage” it has come to my discovery of a first time actor Pauly D.
His first time on the screen has surprised many. His portrayal of Billy a caretaker of Christine’s Mountain house. Just like the film that launched the career of Billy Bob Thorton in “Sling Blade” Pauly D has mastered the mannerism and nuisances of a slow moving, hill Billy mountain character. His performance was exceptional for his first time on the screen. You would never imagine that Pauly D is in real life a professional businessman and successful entrepreneur. Starting his career as a real estate developer, he merged into the entertainment industry unexpectedly and found his creative talent as an Actor. Long time friend and director Ace Cruz discovered him doing a practical joke to make his friends laugh, by putting on some buck teeth and mimicking a hill Billy character from the woods. Director Ace Cruz studied this character and created a story around Pauly D’s character Billy, that started the storyline of “Outrage”. It was quite a discovery to be able to find a character like “Billy” he’s a very interesting and sympathetic character that made the film what it is, says “Ace Cruz”. During the editing of the movie, Oscar award winning Editor Dennis Virkler, commented on his performance as being very good and believable, he was shocked to know that was his first time on the screen. He’s a real natural, Virkler stated. We hope to see more of this actor in future films. Recently honored at the 2009 Action on Film (AOF) International Film Festival in Pasadena, Calif.,, the newest movie from Spirit Films, LLC,“Outrage” was named Best SciFi Picture of the Year. Katie Fountain plays the role of Christine in the movie Outrage. Christine (Katie Fountain) is selling the palatial North Georgia mountain home willed to her by her father. And she’s closing this chapter of her life in style: a lavish weekend getaway with a group of close friends (Natasha Lyonne, Ace Cruz and Derek Lee Nixon). But the lodge was the site of a traumatic childhood incident Christine just can’t shake. The fear and outrage consume her. The vacation, she hopes, will be the source of healing. Natasha Lyonne plays an important role in Outrage movie. The critically acclaimed Lyonne says she was delighted to work with Madsen on such a thought-provoking project. With its unique content and approach, Outrage stands out among the slew of films on her resume. Lyonne began acting at an early age with her first role as “Opal” on Pee-wee’s Playhouse. She appeared in the 1990 film A Man Called Sargeduring the time her family lived in Israel. Lyonne is perhaps best known for her roles in the first two American Pie films as the wise-cracking Jessica. She has also appeared in more than 30 other movies, including starring roles in the independent films Slums of Beverly Hills and But I’m a Cheerleader. Lyonne also appeared in Party Monster in 2003, a dramatization of the Michael Alig story. As the character Brooke, Lyonne donned a fat suit and dreadlocks. After an extended hiatus, Lyonne filmed Goyband in New York City with Adam Pascal, Amy Davidson, Cris Judd, Dean Edwards, Tibor Feldman, and Tovah Feldshuh.